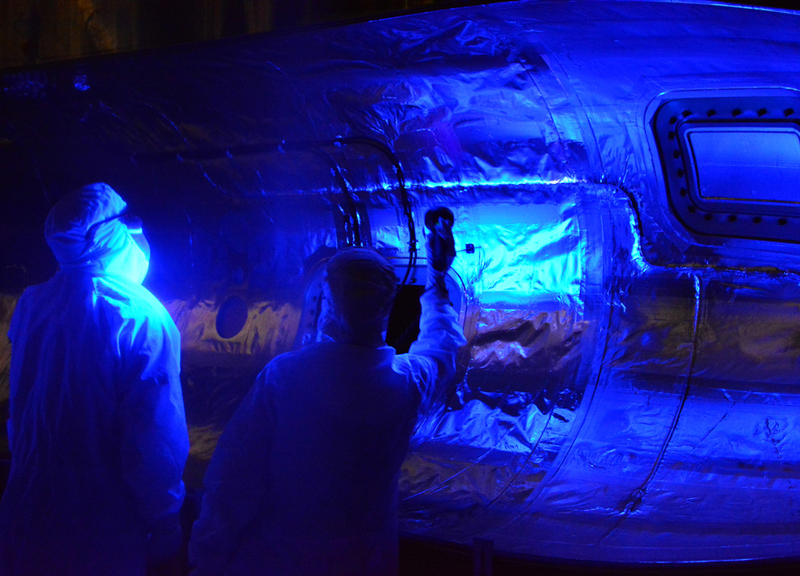 Technicians begin a black light inspection of the Northrop Grumman Pegasus XL rocket inside Building 1555 at Vandenberg Air Force Base in California, on Aug. 22, 2018. The Pegasus port and starboard payload fairings will be installed around NASA's Ionospheric Connection Explorer (ICON). The Pegasus XL rocket, attached beneath the company's L-1011 Stargazer aircraft, will launch ICON from the Skid Strip at Cape Canaveral Air Force Station in Florida. Launch is scheduled for Oct. 26. ICON will study the frontier of space - the dynamic zone high in Earth's atmosphere where terrestrial weather from below meets space weather above. The explorer will help determine the physics of Earth's space environment and pave the way for mitigating its effects on our technology and communications systems.